After recently rebooting his HEY! Records label, Dutchman and long time dance artist Michel de Hey serves up three new cuts this month. 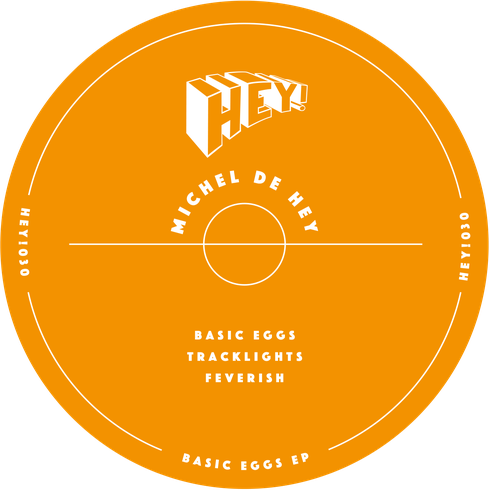 His ‘Basic Eggs’ EP is the latest in a slew of new releases that the label has in the pipeline. Each track from it has been road tested around Europe and has been proven to work, with the title track making it onto the official ‘Extrema Festival’ mix CD. This is de Hey’s first material of the year but comes on the heels of a release on Joris Voorn’s Rejected late in 2015. Versatile from front to back and with support from Carl Cox, Huxley and Laurent Garnier, it should do well. Opener ‘Basic Eggs’ has big drums and cutting synth stabs. It’s a possible booty shaker with crisp production that jumps right out of the speakers and straddles the line between house and techno. Tightly coiled tech house is the order of the day on ‘Tracklights’, with its knotted bass and whirring machine funk making you jiggle your whole body. Skipping hits and real percussive looseness classify this as a possible floorfiller. Last track, ‘Feverish’, drops into a more silky, low slung groove. It is romantic and heartfelt with warm pads and gentle beats caressing you with its coy sense of funk. Tight drums and clean chords add to the lushness.